As our office is located in Las Vegas, one of the biggest tourist destinations in the United States and an attraction for visitors from all over the world, we often are contacted by individuals who are not from this jurisdiction related to cases which arise in the Las Vegas Valley and elsewhere in Nevada while they are visiting here. Literally hundreds upon thousands of people from areas outside of the State of Nevada and outside of the United States, visit Las Vegas and the surrounding communities each year. Whether these individuals are visiting Las Vegas for work, vacation, special occasion or simply to unwind, there are many times these people visiting Las Vegas and the world famous “Strip” (Las Vegas Boulevard) enjoy alcoholic beverages. Unfortunately, in many occasions, these same individuals often wind up behind the wheel and driving a car. While some people arrested for DUI in Las Vegas believe that a DUI in Las Vegas is “no big deal” because their driver’s license was issued elsewhere in another State, these people are just plain wrong. DUI arrests in Las Vegas are a big deal. They are serious crimes and law enforcement in Las Vegas and throughout Nevada is VERY strict on crimes such as those involving an allegation of drinking and driving and DUI. Nevada, like virtually every other State, is part of a collection of States which are members of the Interstate Drivers’ License Compact (or DLC). The DLC is an agreement between the individual States and involves the sharing of information between the States, specifically having to do with the driving privileges of an individual in the State that issued the person’s driver’s license. So why is the DLC important for a driver who finds themselves arrested for a DUI while in Las Vegas or elsewhere in Nevada? Simply put, it means that if you are from another State (and that State issued your driver’s license), and are convicted of a DUI in Nevada, you will suffer the same penalties related to the suspension of driving privileges as if you were caught drinking and driving in your hometown or home state. Under the provisions of the Interstate Driver's License Compact (DLC), each individual “member State” must communicate the fact that a person has been convicted of a DUI in their State, to the so-called "Home State" (the State which issued the driver his or her license). If for instance, an individual with a California issued driver’s license comes to Las Vegas on the weekend and drinks a little too much, gets behind the wheel of a car and gets arrested for DUI, the State of Nevada is duty bound by the DLC to report to the State of California any conviction against the person in Nevada. The "Home State" then takes action against the driver as if he or she had received a DUI in that State, i.e. by suspending or revoking their driving privileges, and his or her driver’s license, under its own laws and regulations. The end result of this interstate system is that in most common situations, it is feasibly impossible for a non-Nevada resident to avoid serious consequences related to their ability to drive in their home state, after they have been convicted for DUI in Nevada. Most people don’t understand that there are actually two different concurrent proceedings taking place when a person is arrested and charged with a DUI. The first is the obvious criminal case for Driving under the Influence. The second is the attempt by the DMV, or similar state agency, to administratively suspend or revoke the driving privileges of the person who is arrested or charged with a DUI. In many cases, the suspension or revocation of a person’s driver’s license can be delayed or avoided altogether if the proper steps are taken by a trained Drunk Driving/DUI lawyer, and taken quickly, in both the criminal Courtroom and with the Department of Motor Vehicles. In addition to the Driver’s License Compact (DLC) as mentioned above, non-Nevada residents have to be cognizant of, and attentive to, the impact of any action taken by the Department of Motor Vehicles in the State where the DUI occurred (i.e. Nevada) against their right to lawfully drive in their own Home State (i.e. the State that issued their Driver’s license. Our office encounters many visitors to Las Vegas, Nevada, who erroneously assume that if they aren’t notified and brought before the Court to be told their license has been revoked or suspended they won’t have any problems receiving or maintaining their right to drive in another state. This is unfortunately not the case. Under the Non Resident Violator Compact (NRVC) registry, any State that takes action against a driver for a DUI related offense must report that information to the other member states. The end result is the state which issued the license suspends the driver’s license of the person charged for DUI in Nevada. 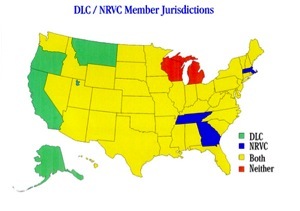 To further reveal the scope of the DLC and NRVC member states influence, take a moment to look at the most recently updated member state information. If you, or a loved one, have been charged with a Drunk Driving or DUI related crime while visiting Las Vegas from another state or city, you are not alone. At our office, we have handled countless cases of individuals in a similar situation and our results show that we have achieved numerous favorable outcomes for our clients. Contact our office today and let us help guide you through this difficult time and these serious charges.